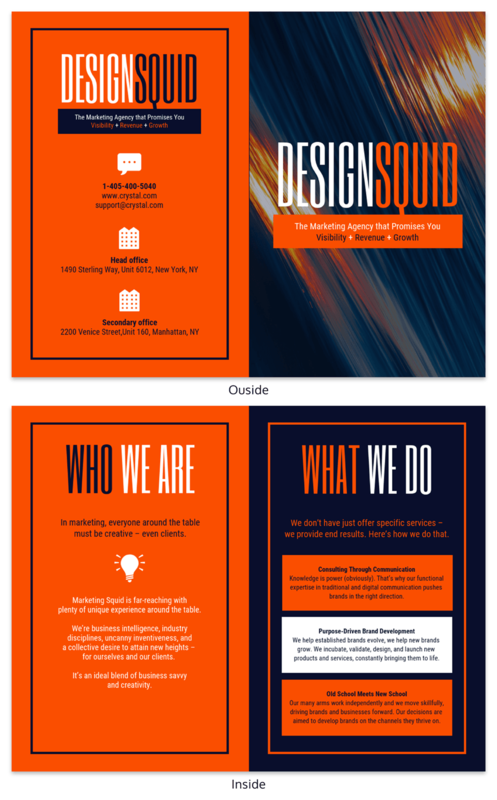 In today’s digital world, people still care whether or not your business has helpful, informative and professional bi-fold brochure s.
Whether you’re a solopreneur or part of a small company, print-marketing collateral is a huge brand asset. Your informational bi-fold brochures and business brochures reassure people that you’re an established, legitimate business. It’s one of the ways businesses build brand trust through design. Plus, it’s a great way to showcase your brand and create engaging marketing content that people can actually keep. 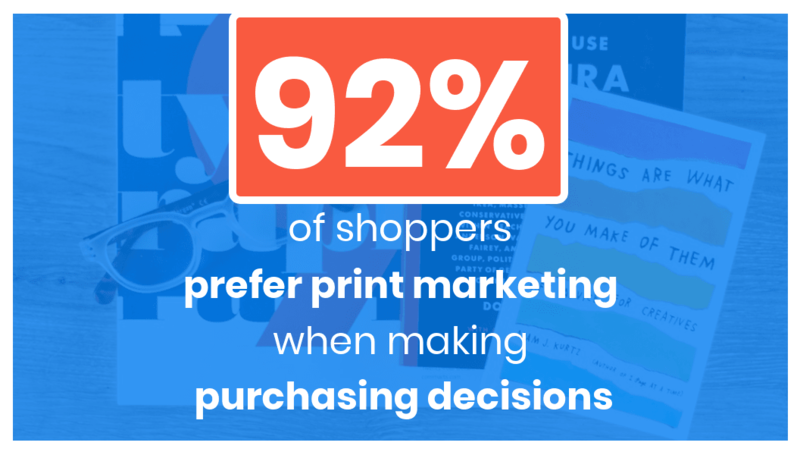 It may come as a surprise, but a whopping 92% of shoppers still rely on print marketing when it comes to making purchasing decisions. One reason bi-fold brochures and other print marketing materials are effective, is due to a feeling of psychological ownership. Psychological ownership is the feeling of connection people have to things that they can touch and hold. That’s an experience print marketing provides that digital marketing just can’t. 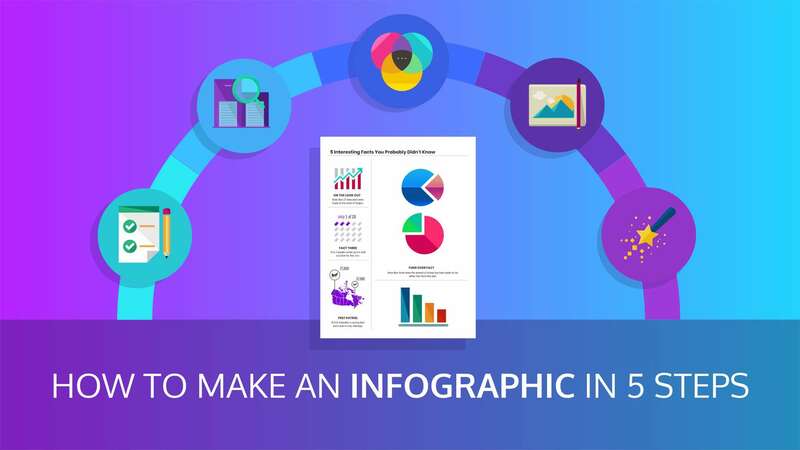 And with online tools and templates making good design accessible to business owners, marketers and content creators alike, creating professional bi-fold brochures doesn’t get any easier. Keeping up with graphic design trends. 1. What is the purpose of your bi-fold brochure? It’s a simple question, but an important one! 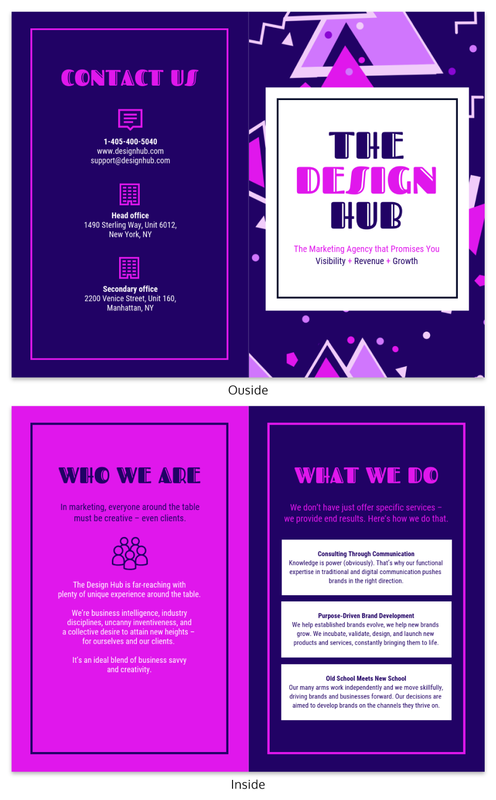 If you jump right into your bi-fold brochure design, you’ll spend hours editing your work. Or you’ll create something generic that doesn’t resonate with your brand or your audience. You want your bi-fold brochure design to be effective, impactful and memorable. So, to make the most of your time and effort, determine the purpose of your bi-fold brochure. 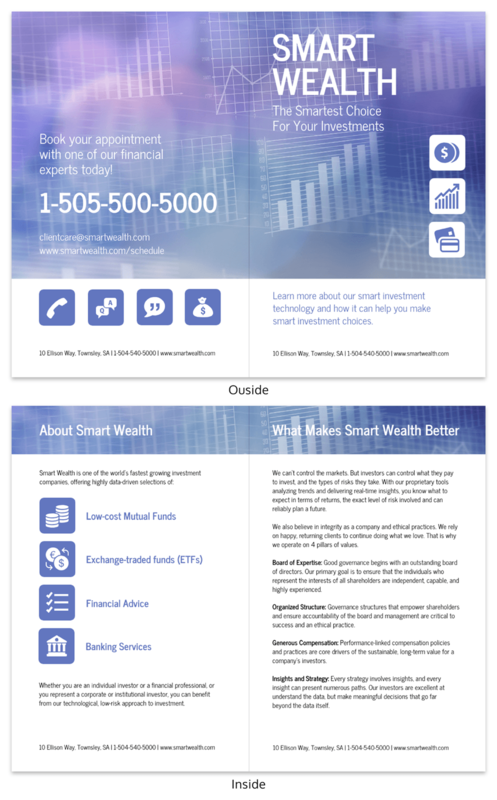 Are you marketing your business and its services with a business bi-fold brochure ? 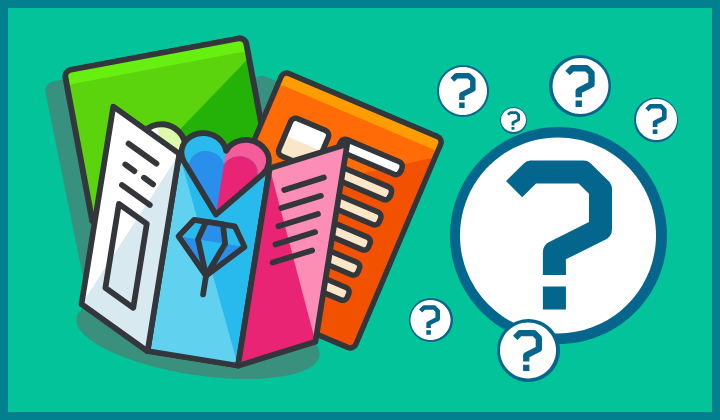 Are you providing helpful information to clients or patrons with an informational bi-fold brochure? 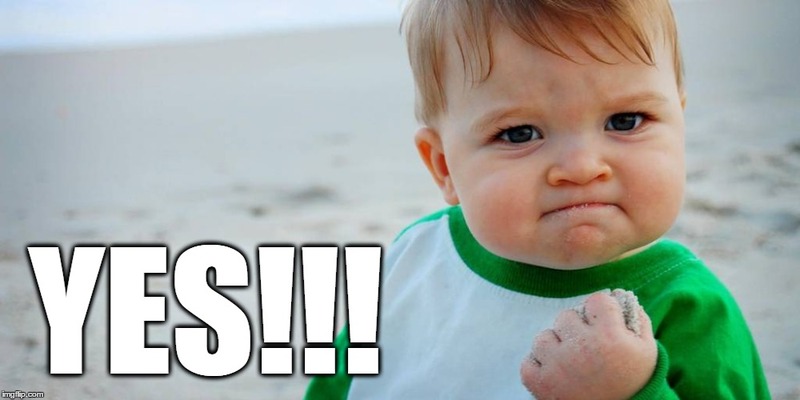 Do you want people to visit your website, register for an event, or call your office? Consider your overall marketing plan and the marketing goals you’ve set for yourself. 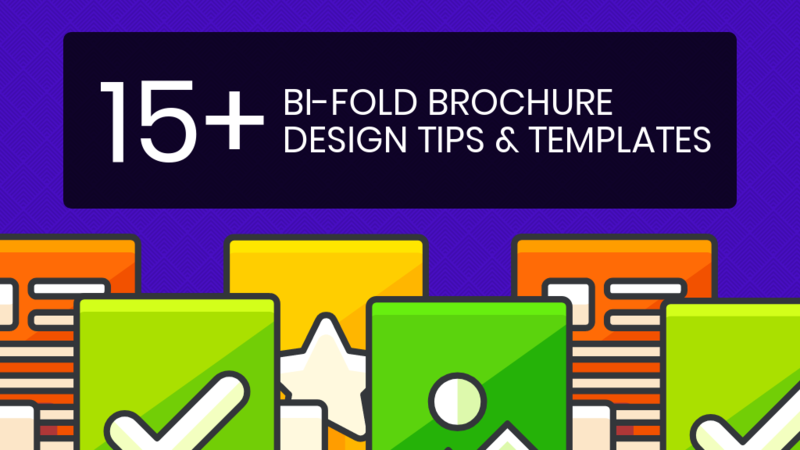 These will help you narrow down how to best approach your bi-fold brochure design. When you know exactly what your bi-fold brochure is for, then it’s a lot easier to design something relevant. You’ll have a clear sense of what to include and the type and style of bi-fold brochure you need. 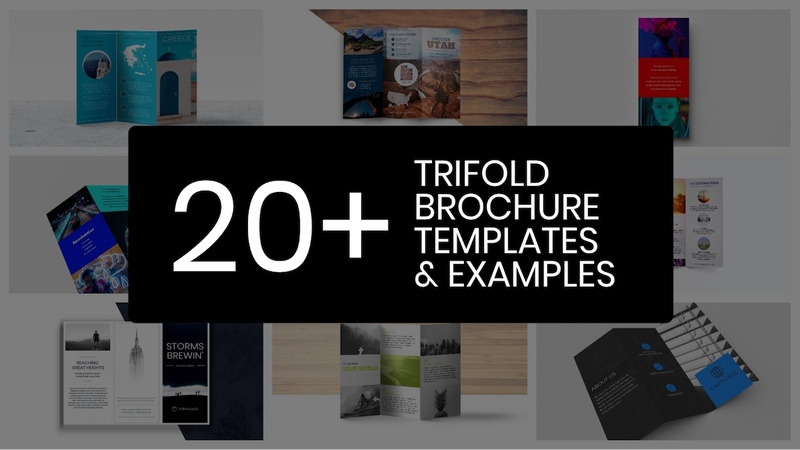 This post focuses on bi-fold brochures, but there are a lot of different brochure styles that you can use. 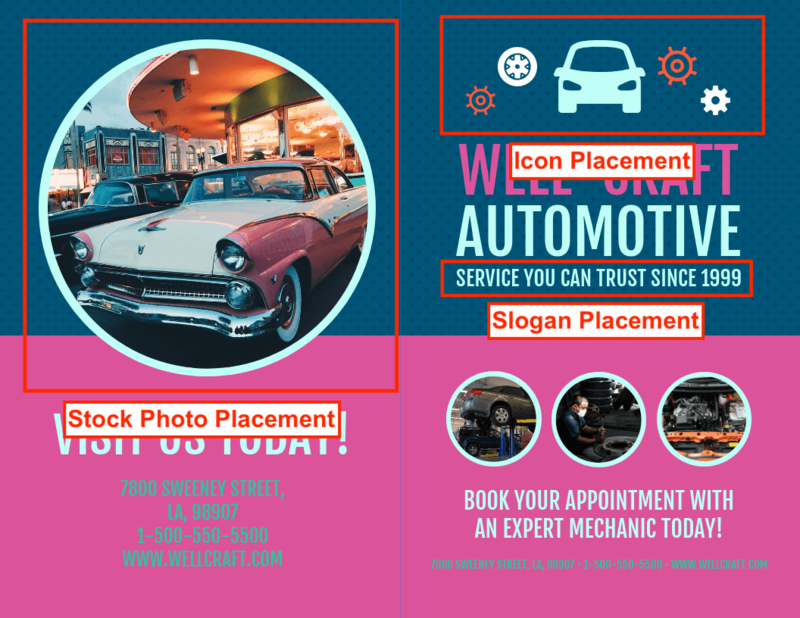 Actually, you can create entirely custom layouts for your brochures. However, that gets a little complicated and requires a lot of planning, designing and resources. Each of these layouts have their advantages and which one you choose depends on what you’d like to achieve. The massive header can be read from a distance, and a simple stock photo background is all it takes to add some life to your design. Even with minimal text, it makes for an engaging design. 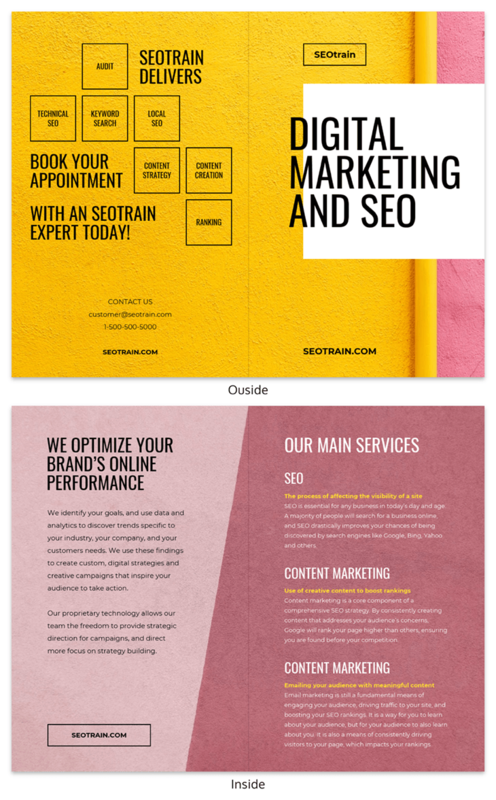 The bi-fold brochure’s outside pages lets you share general information, an enticing slogan, a call-to-action or unique selling proposition. Then the inside pages can be packed with helpful, detailed information. 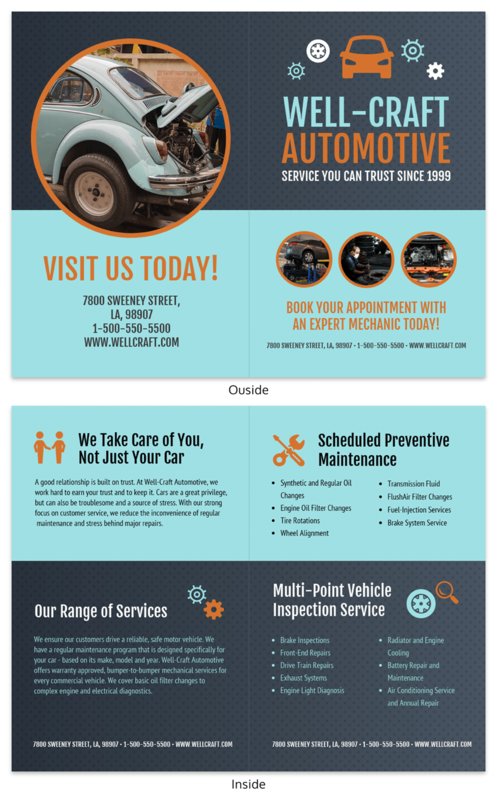 Designing a tri-fold brochure requires more planning than a flyer or bi-fold brochure. Your marketing copy has to be compact, concise and sectioned in a way that makes sense to readers (when it’s closed or opened). 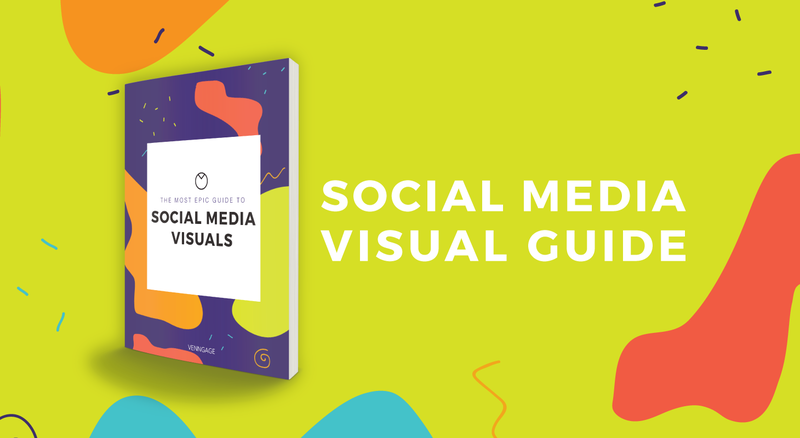 However, it’s also a great way to share a ton of visual content! Using a professional bi-fold brochure template is a no-brainer, whether you’re a designer or non-designer. First off, it’s a major time-saver. 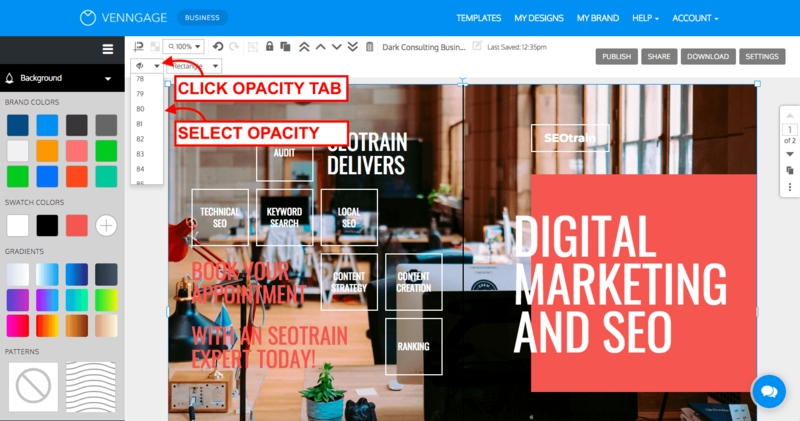 When you start from scratch, you have to set the size of your page, format it, determine a theme, create a layout, decide font styles and more. You can spend hours before you even get to actually designing anything. With bi-fold brochure templates, you can start designing right away and cut your hours down to minutes. 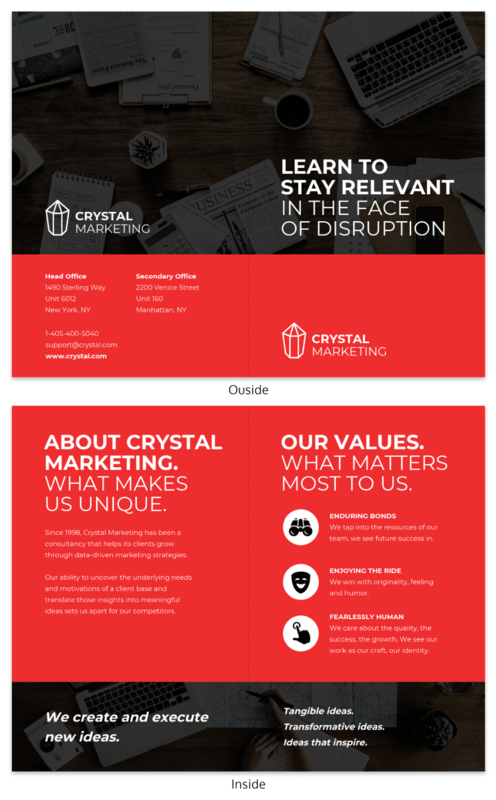 Bi-fold brochure templates are also great sources of design inspiration. Even browsing a library of bi-fold brochure templates can give you design ideas that you might like to try out. 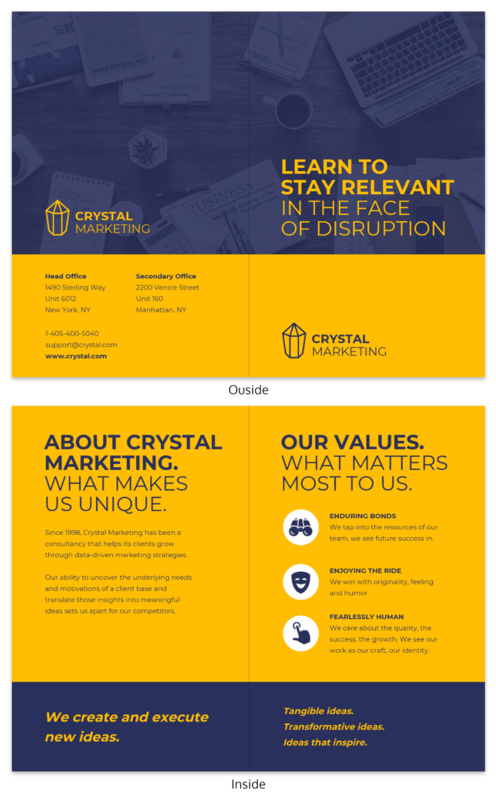 Most importantly, great bi-fold brochure templates help you stick to sound design principles. I’m not a trained designer myself, so I find following a layout really helpful. I can create something that’s consistent, uniform and professional by just following an existing format rather than coming up with something entirely on my own. Your bi-fold brochure doesn’t need to just list all your products, services and prices. In fact, that might not be very effective if you want them to think about you in the long run. Highlighting how your organization runs, or sharing the types of problems you solve for consumers are easy ways to build trust. Walking your audience through the different ways you address their issues makes you memorable. 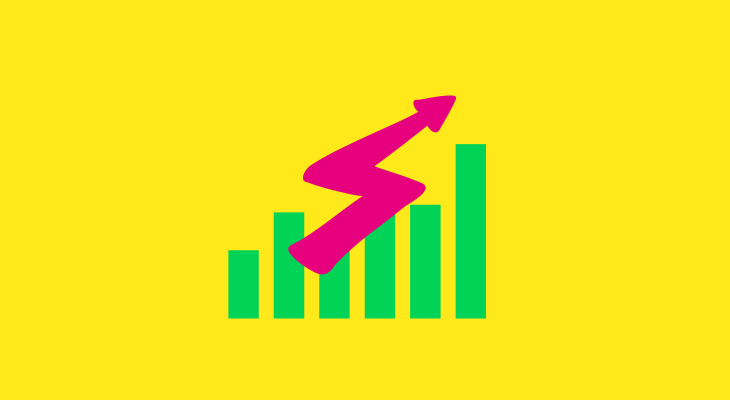 It lets you stand out over competitors who are pushy and sales-y. 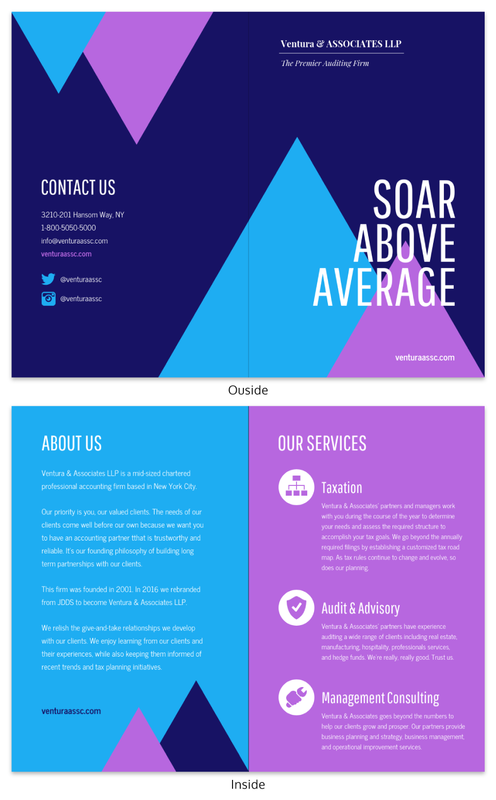 The below marketing consultant bi-fold brochure template maintains the separate quadrants of the brochure. Rather than spilling over into the other page, the design doubles down on the existing boundaries to make each section stand out. It’s an easy way for people to take in the entire bi-fold brochure without feeling overwhelmed. You can even add borders to help emphasize the distinction between sections. 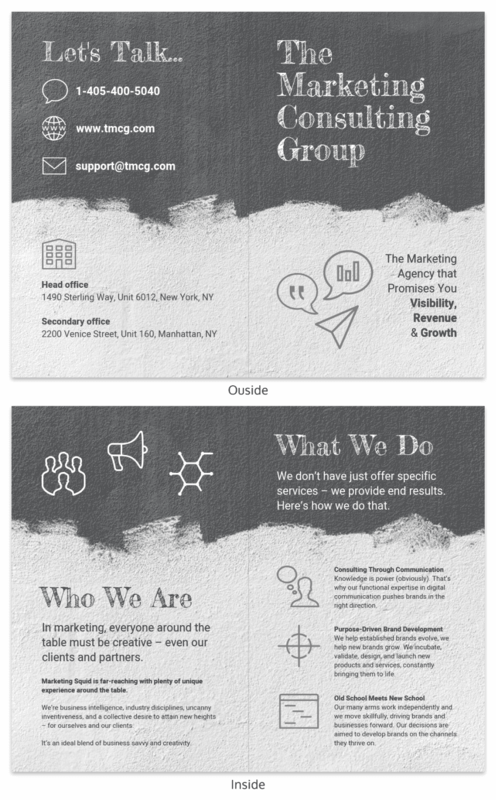 This is a great approach if you think your bi-fold brochure is text-heavy. The four sections break your text into smaller, manageable chunks that readers can scan. It also makes it easier for them to read the entire bi-fold brochure, rather than lose interest a third of the way through. You can create quadrants through alternating colors, alternating background designs, or by applying borders like the template does. 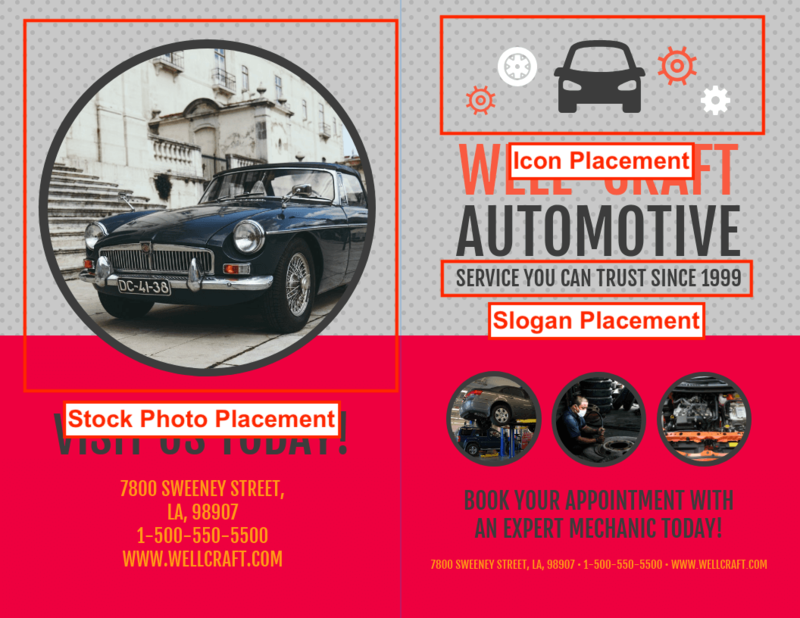 A high-quality stock photo is a great design touch to incorporate into your bi-fold brochure design. High-quality stock photos help your marketing content appear professional, and are highly engaging. 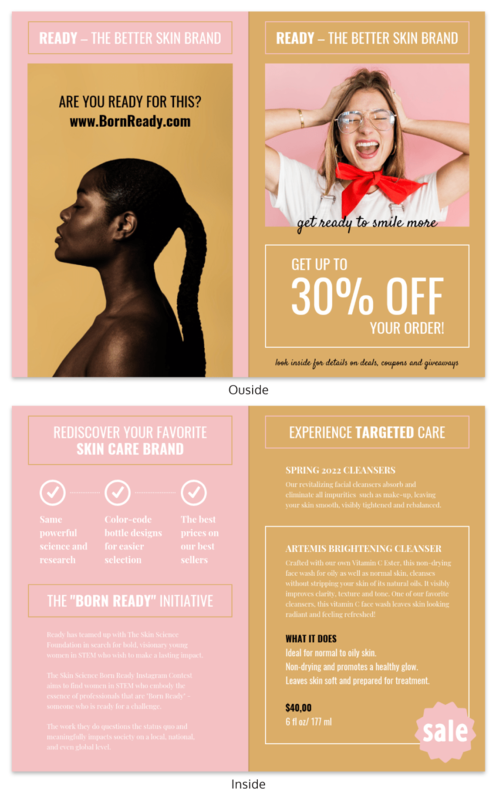 This Skincare Product Bi-Fold Brochure Template uses a stock photo as focal point on the first page. It uses another fitting stock photo as a background on the back page. Both provide an engaging look that keeps the audience’s attention. Stock photos are an easy way to get high-quality collateral, without having to pay the high costs for professional photographers. Of course, if you do have some high-quality photos of your business, staff, office space, use them! The more personable, authentic and relevant your images, the greater an impact they’ll have on your audience. Just make sure your own photos are high-resolution images. Low-quality images can appear pixelated and fuzzy when they’re printed out. While vibrant stock photos can be captivating, they can drown out your headers and text, making your message unclear. 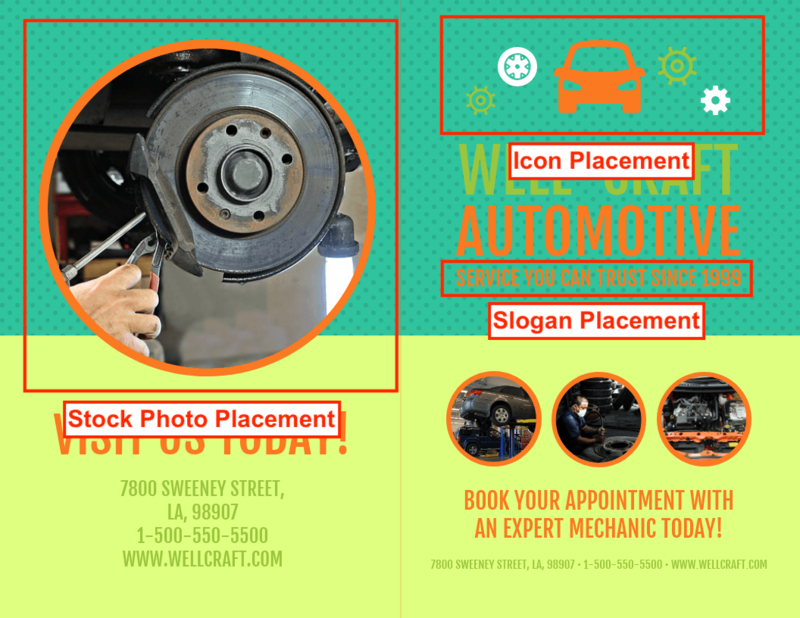 At the same time, without a strong stock photo, your bi-fold brochure design can be left looking a little bland. So here’s a simple fix: transparent overlays. Transform your background photo into a transparent overlay. That way you can subdue the colors in your background photo enough to let your content stand out. At the same time, your background photo still shows up so that you’ve got an engaging and captivating visual in your design. That’s all there is to it. 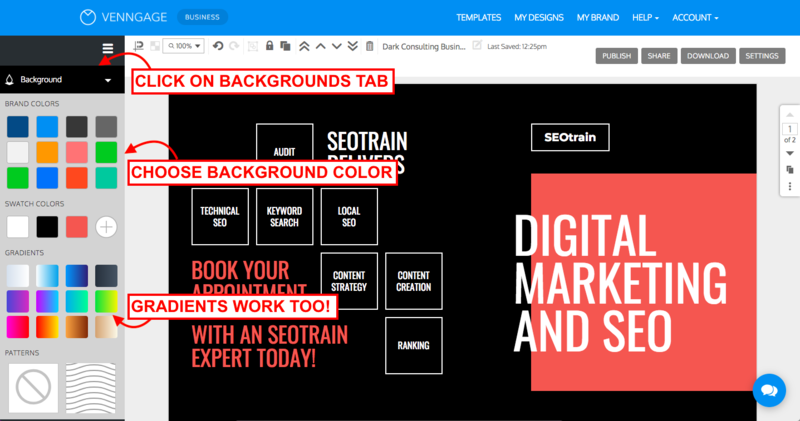 Transparent overlays are a simple design hack that gives any design a professional look. With a bi-fold or tri-fold brochure, you can apply photo overlays to both the outside and inside pages for an engaging visual experience. 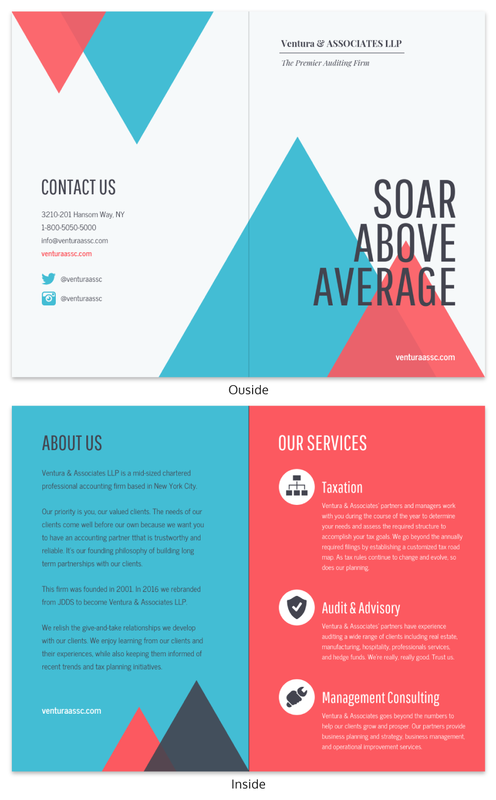 Once you’ve created your sleek bi-fold brochure, be sure to save it as a template for future bi-fold brochure designs. This way you have access to marketing collateral that requires minimal changes for a brand new, effective design. It’s also a great way to get started on creating a brand style guide, since you’ll have marketing collateral that’s on brand to use as examples. 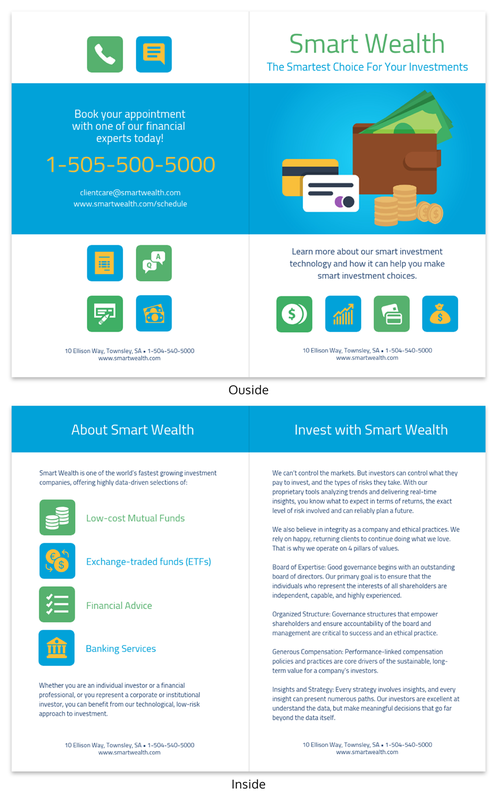 This bi-fold brochure design does everything that a business bi-fold brochure should. Without altering too much, we can still create new, effective designs. We can maintain the icon placement and messaging, but apply new color palettes and stock photos for unique looks. 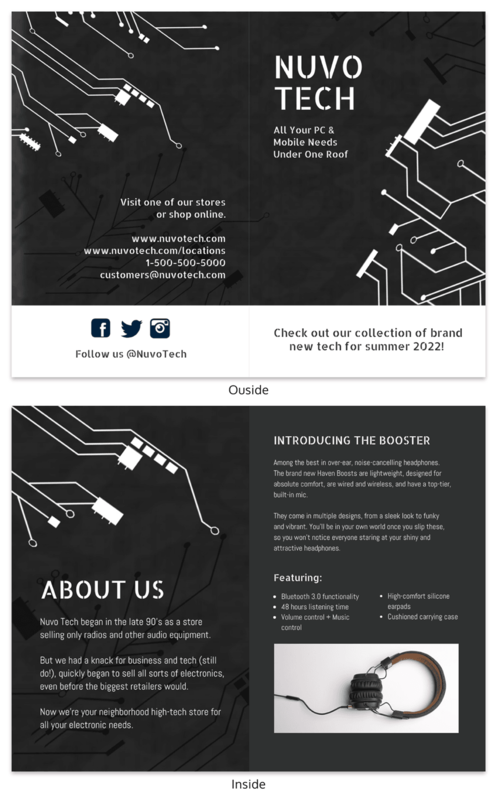 With minor changes, you have a set of neat bi-fold brochure designs that showcase your brand in different ways. 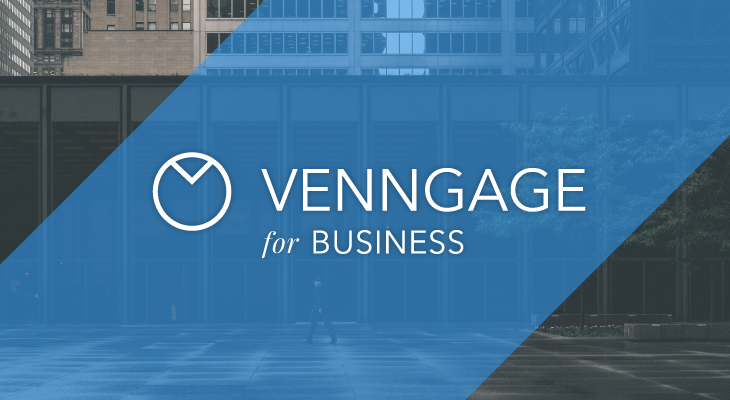 You can save your brand elements, such as your logos and color palette to My Brand Kit, to easily access them in the Venngage editor. 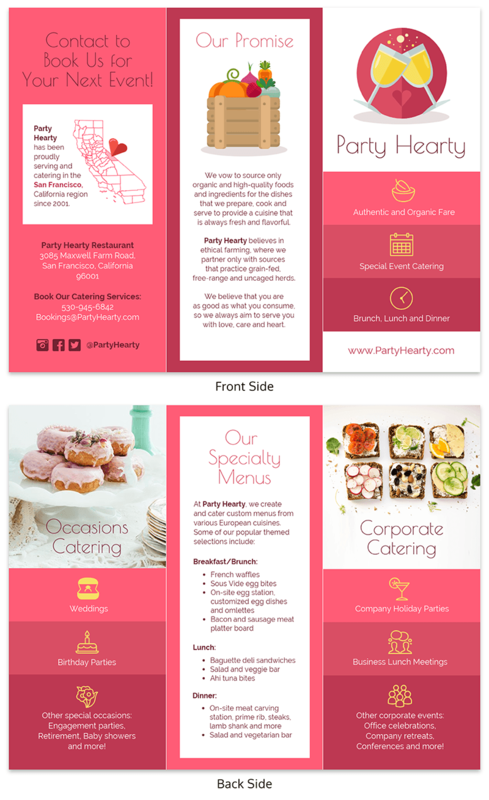 My Brand Kit also has pre-set color palettes for you to choose from, which how the color schemes for these mock bi-fold brochure s were created. It’s important that the central message, or focus of your bi-fold brochure is loud and clear. For one, it grabs people’s attention. But you have to also consider the fact that people might see your bi-fold brochure from a distance. With all the other things competing for their attention, the more readable it is from a distance, the more likely your bi-fold brochure is to getting noticed. Regardless of what you’re designing, choosing the right font can be tricky. The fonts you choose to use can really impact your design. We even dedicated a blog post on font selection that you can check out. When you use too many fonts or even too many different-sized fonts, you risk designing something unorganized, that’s hard to read and understand. But a single font and size makes your bi-fold brochure design look as boring as Ben Stein sounds. Here’s how to strike a balance. Your font styles and sizes should help you establish a ‘hierarchy of information’. 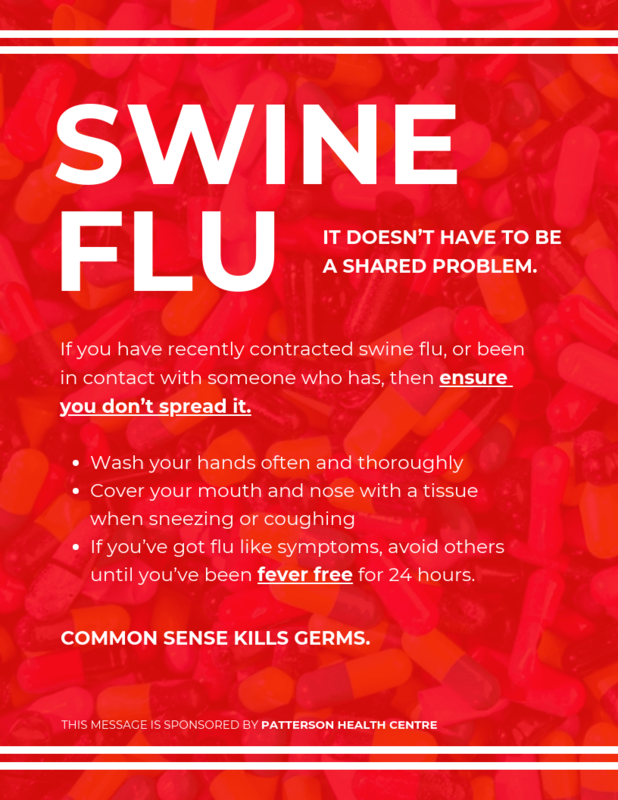 Generally, relevant information should be large and easy to spot. As your audience continues reading, the font sizes should decrease so you can share more important, detailed information. As you move down the page, the information gets more targeted and specific. But the top of the page is designed to grab attention. 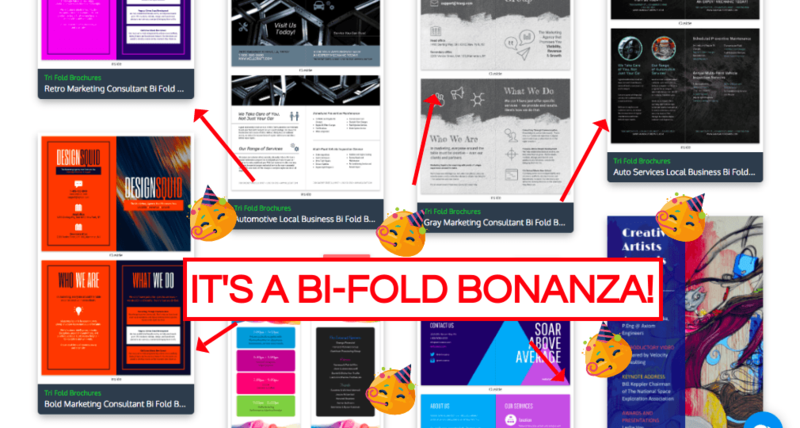 Just keep in mind, when you have too many fonts and text sizes, it becomes unclear what’s most important in your bi-fold brochure, or what your bi-fold brochure’s key takeaways are. 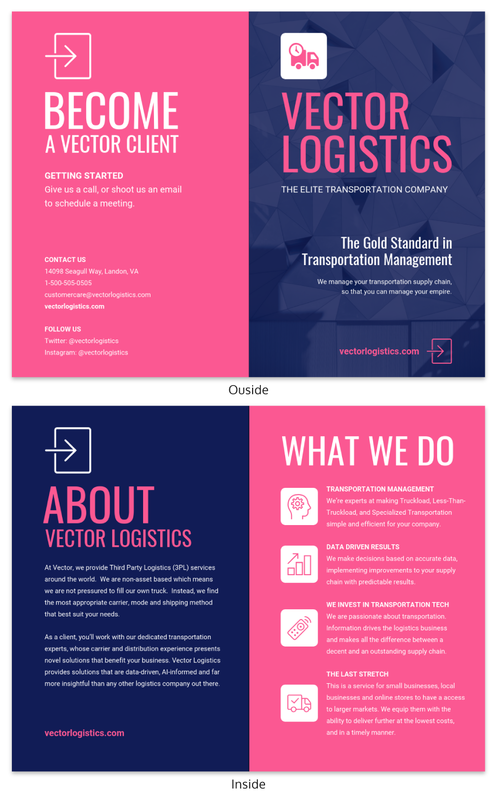 Another great way to incorporate visuals into your bi-fold brochure design is icon usage. With a diverse icon library allow you to create designs for almost any industry and demographic. 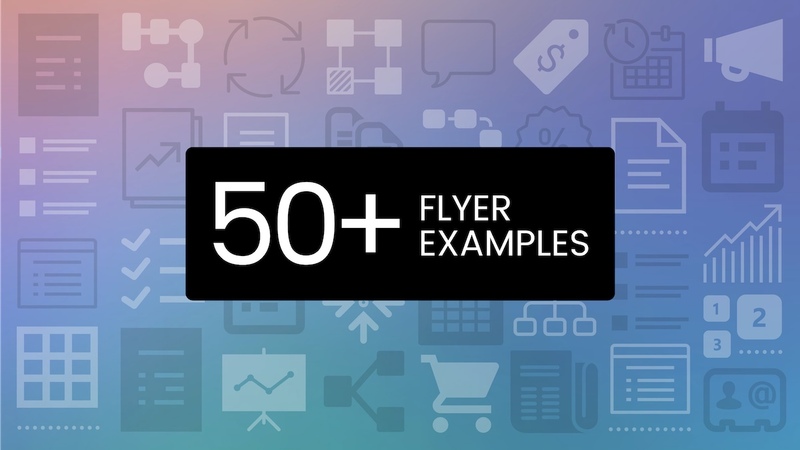 Icons also help make your information more memorable, since visuals are easier to recall than plain text. 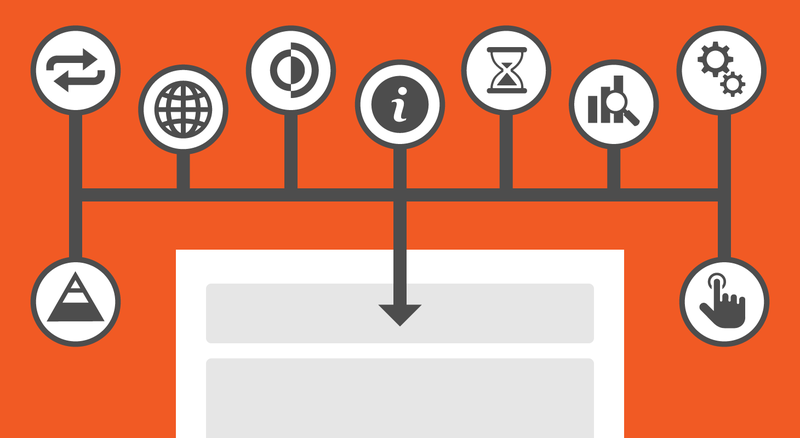 The types of icons you use (line icons, flat icons or illustrated icons) is totally up to you. But make sure you stick to one type of icon for a consistent design. Using different icon styles is a lot like using too many fonts. Your design just ends up looking unorganized and incomplete. Negative space is just empty space in any design. 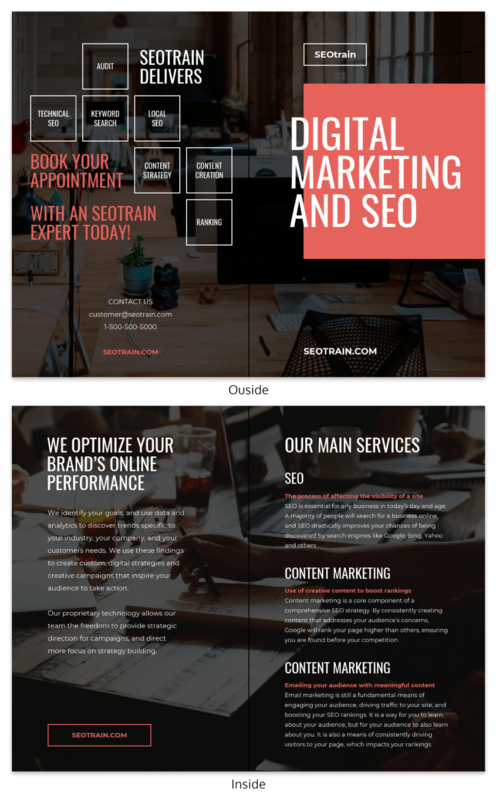 It also plays a very important role in creating professional bi-fold brochure s. Balancing your content with negative space helps your bi-fold brochure appear organized and makes it easy to read. It might be tempting to fill each corner and gap between text with an engaging image or icon. But without a healthy amount of negative space, your content will end up looking jumbled. Maintaining a level of negative space also forces you to be concise in your messaging, and minimize text wherever you can. The thought of saying very little on a bi-fold brochure might make you anxious. It’s natural to want every facet of your brand or business to stand out. However, the most helpful thing for your audience in a bi-fold brochure is to be concise and relevant. A strong unique value proposition, a compelling call-to-action or a brief explanation of your services or products is enough to attract the right customer or client. A bold header gets straight to the point (what the company does), there’s a clear call-to-action, and services are neatly listed. A conservative approach lets you appear confident and established. It also makes it that much easier to remember what your business is all about. A bi-fold brochure that tries to share everything about the business won’t leave a lasting impression. Whereas, a bi-fold brochure that says just enough, maximizes what gets remembered. Want to master print marketing? 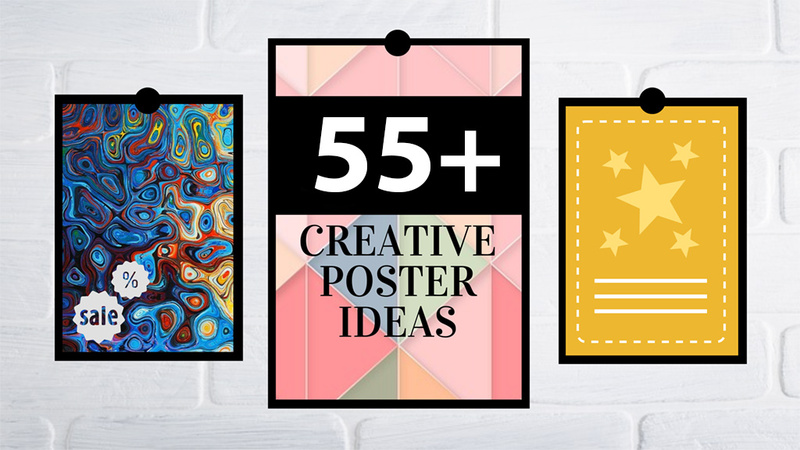 Check out these additional resources for more design tips, professional templates, and marketing hacks.